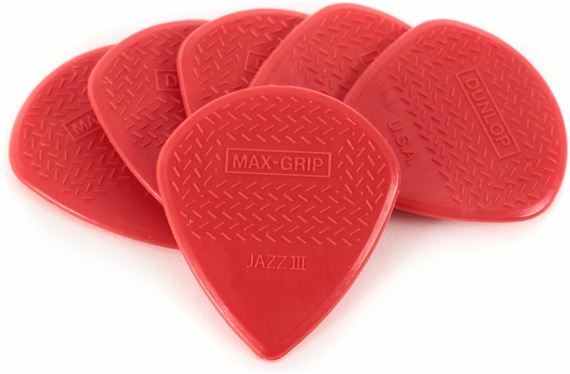 Combines Max-Grip technology and Jazz III pick shape for extreme precision and durability! The Max Grip Jazz III combines the Classic Jazz III shape with Dunlop’s cutting-edge Max Grip technology. This non-slip grip is molded into the entire gripping surface for incredible control while the tip features the same sharp and beveled shape for quick string release. Players looking to increase their speed and articulation and Jazz III fanatics alike will benefit from this amazing combination. I'm Picky, and these picks,are the picks i pick!!! It took me a little while to get used to these. After studying Eric Johnson, I gave them a shot and now I love them. You can have a lot of speed and control without much effort. JP uses them. Need I say more? I have been using jazz lll picks for a few years now. I like these picks but I do prefer the feel and bite I get from the tortex. Still a fine pick for clean or acoustic guitar. I feel like I have a lot more control with these thicker, stubby picks than I ever did with traditional ones. It takes some practice to get a good strumming technique down, but for single notes or power chords these are awesome. Can't believe I didn't try these sooner! These picks are amazing. I've used the black Stiffo Jazz IIIs for about 12 years or more and have never been disappointed in their performance. However, sometimes they do get a little slippery, which causes me to grip harder with my fingers, thus causing fatigue more quickly. So far, these seem to fix the problem because with the rough gripping surface, I don't feel like I have to clamp down on the pick so much. The carbon fiber material looks and feels great too. I like the way it gives a more aggressive tone when I play heavy riffs. All in all, a great product. These are the best picks I can imagine using at the moment.